Market Insights from the Bramshill Investments Team. 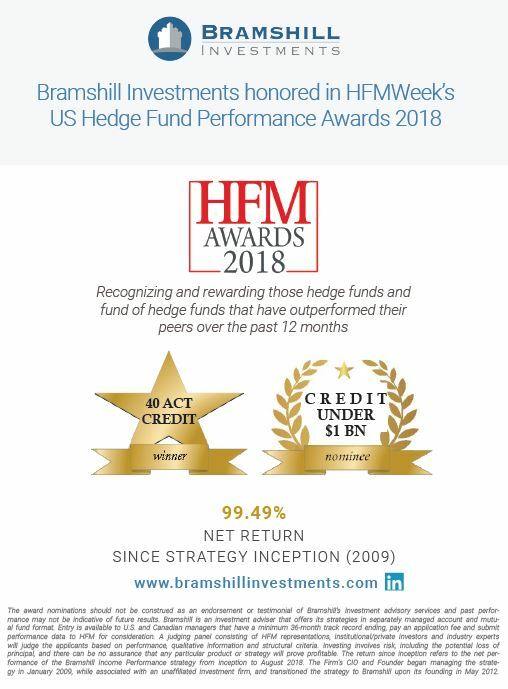 Hackensack, NJ – After recently being nominated for two HFMWeek's 2018 US Hedge Fund Performance awards, Bramshill Investments won for Best 40 Act Credit. Other nominees in the category included BlackRock Global Long/Short Credit, American Beacon GLG Total Return Fund, Brandywine Global Alternative Credit, Guggenheim Macro Opportunities Fund and Water Island Credit Opportunities. Bramshill's core investment strategy, the Bramshill's Income Performance Strategy was spun out of an absolute return fixed income strategy managed by Bramshill Founder and CIO Art DeGaetano while at GLG Partners. The Strategy has a proven track record of over nine years with an absolute return objective. Since inception, the Strategy has delivered an annualized net return of 7.34% and a cumulative total net return of 99.49%. Today, Bramshill Investments has approximately $1.45 billion in assets under management. The Strategy is an alternative to traditional fixed income and this approach has led to the recognition from HFMWeek and from investors as the Firm's AUM has grown to approximately $1.45 billion as of 9/30/2018. Bramshill seeks to harness the best risk-reward investments across fixed income with a flexible and opportunistic mindset. The firm manages its strategies in both separately managed accounts and mutual funds. "At the firm and portfolio level we prioritize risk management across all strategies, which have allowed us to produce significant returns for our investors while avoiding material drawdowns" said Art DeGaetano, CIO and Founder of Bramshill Investments. 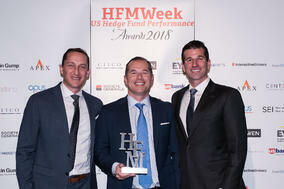 "Our entire team is honored that we have been recognized by HFMWeek and our peers." INTERESTED IN BRAMSHILL'S CURRENT MARKET OUTLOOK? The award nominations should not be construed as an endorsement or testimonial of Bramshill's Investment advisory services and past performance may not be indicative of future results. Bramshill is an investment adviser that offers its strategies in separately managed account and mutual fund format. Entry is available to U.S. and Canadian managers that have a minimum 36-month track record ending, pay an application fee and submit performance data to HFM for consideration. A judging panel consisting of HFM representations, institutional/private investors and industry experts will judge the applicants based on performance, qualitative information and structural criteria. Investing involves risk, including the potential loss of principal, and there can be no assurance that any particular product or strategy will prove profitable. The return since inception refers to the net performance of the Bramshill Income Performance strategy from inception to September 2018. The Firm's CIO and Founder began managing the strategy in January 2009, while associated with an unaffiliated investment firm, and transitioned the strategy to Bramshill upon its founding in May 2012. Don't miss out on exclusive content offers, insights, and more! © 2019 BRAMSHILL INVESTMENTS, LLC. All Rights Reserved.